Posh stars Shaquile Coulthirst and Nathan Oduwa celebrate a goal against Southend. Photo: Joe Dent/theposh.com. 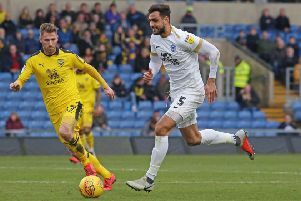 Nathan Oduwa scored twice as Peterborough United opened their Central League campaign with a convincing 4-0 win over Southend today (September 13). Shaquile Coulthirst also scored and was credited with three assists. The former Spurs striker is available for a loan move and was watched by two National League clubs at the Posh training ground. Nathan Oduwa scores for Posh against Southend. Photo: Joe Dent/theposh.com. A young trialist also netted. Posh will not be releasing his name. The Central League is an under 23 competition and Posh are managed by club legend Dave Farrell. His side dominated most of the match, but didn’t break the deadlock until the second-half. Coulthirst missed a couple of first-half opportunities, while Matty Stevens was twice denied by fine saves from the visiting ‘keeper. Nathan Oduwa on the attack for Posh reserves against Southend. Photo: Joe Dent/theposh.com. Southend midfielder Luke O’Neill struck the Posh crossbar direct from a free-kick before Posh took control of the scoreline after the break. On loan Spurs winger Nathan Oduwa was on hand to convert from close range after Coulthirst had sped down wing and delivered a superb cross. Oduwa’s second goal arrived from the same source before Coulthirst set up the trialist for number three. Coulthirst was then tripped in the penalty area and he picked himself up to complete the scoring from the spot. Young Posh striker Dean Moore played strongly throughout and was only denied a goal by some smart goalkeeping. Posh: Tyler, White, Binnom-Williams, Tafazolli, Almeida Santos, Chettle (sub Penfold), Oduwa, Stevens (sub trialist), Coulthirst, Moore. Unused subs: Elsom, Freestone, Cartwright. Southend: Bexon, Bwomono, Matsuzaka, Coutts, Clifford, Bedford, Bridge (sub Batlowkwa), O’Neill, McLaughlin, Antoine-Fortune, McGlashan (sub Walker).